I'm having trouble debugging server side coffeescript in latest WebStorm 6 EAP. How should I reference coffee sources in source maps? I tried absolute and relative to the project root paths - still not working. Or is there a requirement to have all the files in the same folder? Lena, thank you for your answer! WEB-6460 bug seems to be the reason why I'm not getting my source maps working. Sergey, would you be able to share with us how you went about getting set up for CoffeeScript debugging with WebStorm 6? I have not been able to get source map generation to work via file watchers (this is even after adding the --map argument to the configuration), however I did manage to get source maps generated (only for some files, which is really weird) by adding a "Generate CoffeeScript Source Maps" step to the "Before launch" run/debug configuration. In any event, I am unable to debug the project, let alone hit a breakpoint via a source map, so I was wondering if you could share your steps in getting closer to having this working. Check this screencast to find out how to modify the standard CoffeeScript file watcher to generate source maps. Thanks for that! I now have the file watcher properly configured to compile CoffeeScript to JS and also generate the source maps. The video shows how to debug an HTML file, and that seems to work fine. But what about Node.js directly? Here's what I've got for my Run/Debug configuration. Unfortunately, this does not appear to work, as I do not see the option to Debug, only Run. Is there anything wrong in my configuration? I generate source maps using my own grunt task (via coffee-script 1.6.1 or coffee-script-redux), not using file watchers. I didn't find them useful as there's no command to compile all coffee files at once. You are able to configure a custom file watcher which runs your grunt task on changes of *.coffee files. Thanks for your help guys. Generating .map files is now completely clear, but how exactly would I go about the actual debugging? I thought I'd post a few more details so you guys get a better idea of exactly what I've got. euskode:src mcc$ coffee -c --map . My question is, how would I go about debugging this so I can set breakpoints in the CoffeeScript source files? I realize that Node.js does not support this directly, so I have started using node-source-map-support for stack traces. However, what I am really after is being able to hit a breakpoint in WebStorm for my CoffeeScriipt Node.js server-side code base. I do think this is possible, isn't it? Do you start your application using "Debug" command (Shift + F9)? Do generated map files seem valid? Cause I don't see any problem with your project. node-source-map-support just for the stack traces, doesn't do anything for breakpoints. NodeJS debug should works with sourcemap backed scripts. If it doesn't work, please create issue and attach test project. This topic is not about NodeJS, so, http://youtrack.jetbrains.com/issue/WEB-6460 is not relevant. Could you take a look to see if there is something really basic that I am doing wrong here? If you can't figure it out, I will definitely go ahead and open a bug. Hopefully this is something really small and I can finally hit a breakpoint in Node.js CoffeeScript! I'm sorry, we'll get back to you on Monday. Vladimir, thanks for pointing me there. I will continue all discussion of this issue on YouTRACK. The key info I was missing is that you should start the debugger on the generated .js file. 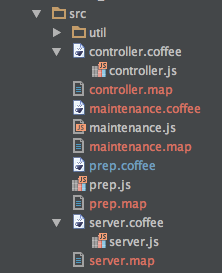 The debugger will then automatically stop at breakpoints set on your .coffee file. 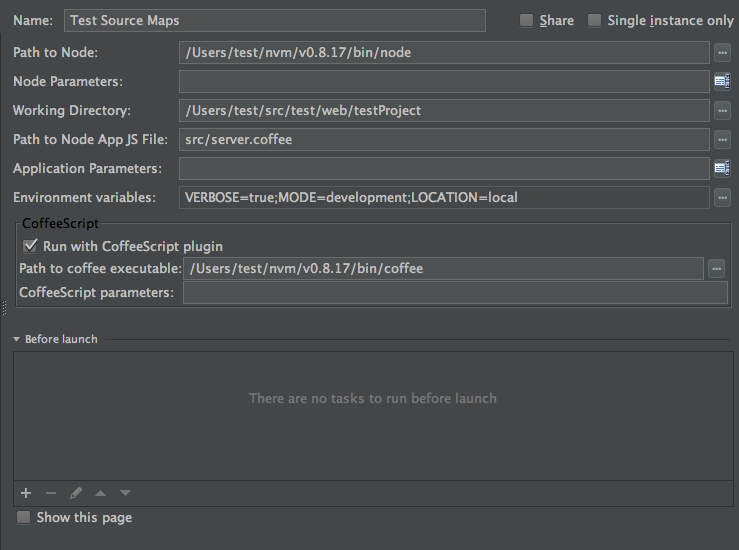 Set a File Watcher with CoffeeScript version 1.6.2 (non-redux) to automatically generate .js and .map files. CoffeeScript redux might also work, but I haven't managed to use it (and you no longer need to). Check that the two .js and .map files appear as children of your .coffee script file item in the files tree of the Project panel. For the record, you can also run your Node.js .coffee scripts directly from IntelliJ IDEA with the "Run" command, but that has nothing to do with debugging them. You can also debug coffeescript when the corresponding .js is loaded from an HTML page in Chrome by launching the debugger on the HTML file, but that's also irrelevant here. I can also confirm that this is all 100% working on WebStorm 6.0.2, build WS-129-221. Thanks for all the hard work!